The objective of this publication is to provide a practical approach to the management of arc flash risk within electrical installations. It provides general guidance on the causes of arc flash events and the dangers to personnel, along with a risk assessment process and hierarchy of control measures that can be used to reduce the likelihood of an arc flash and reduce its potential dangers. 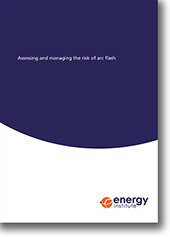 The guidance seeks to address uncertainty within industry of when an arc flash risk may exist and how it should be assessed and controlled, as well at what level in the organisation the risk should be managed (i.e. by the frontline or management level controls). It also provides an overview of the various methods for calculating incident energy. a practical tool to aid electrical engineers and others with specialist electrical knowledge to assess arc flash risks.